Nothing happens by accident when your soul gets involved. It is the most intentional presence in your life whether you recognize its existence or not. Your soul is all knowing, all seeing and ever present. It informs us of our decision making processes, through the thoughts it provides. It is the force that fuels your intuition. When you are certain of something it is your soul’s voice that speaks from the depths of your being. When a mysterious coincidence occurs it is often the design of your soul’s whimsical nature. The soul has a sense of humour and often speaks to us through metaphors, symbols, riddles, and clues. These hints require our full attention and trust in order to uncover their meaning. 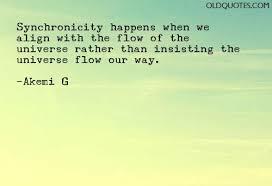 Synchronicity is a term that is frequently used to represent the process of experiences coming together and forming some sort of meaning. Synchronistic occurrences can be alarming or frightening, but they propel us forward with a surge of courage. Their bold metaphysical signs fill us with a sense of awe and wonder and they leave a pile of questions to unravel in our inquisitive minds. These are unexplained moments. We wonder how a circumstance comes in our favour right at the crucial moment we need it most. A person comes into our presents and offers just the right words to push us from feeling like we are freakish, or even worse, going crazy. Synchronicities are incidents of spiritual significance that ask us to quieten our Ego and consider the possibility of a force greater than ourselves. If we think about something and then it appears there is a mystery involved that is fascinating. Perhaps our soul is trying to send us a message so that we may become aware of something that requires attention. Synchronicity happens to me everyday, gentle reminders constantly gifting me puzzle pieces for my life’s journey. Never discount anything as coincidence or just a fluke, it doesn’t work that way, not when you are engaging in your Soul Work. The Universe is always our number one divine guidance, it will never steer you wrong, the question only becomes whether you are willing to accept the clues, and the courage to proceed forward. Never be afraid of what is coming next, after all, you are the one that signed up for this particular human existence, you knew what you were doing, before you came, trust!